"Easter with a kick! Every year I make deviled eggs, and this year I wanted to try something new. This is my own creation; a good balance of richness and zesty flavor! Garnish with Buffalo wing sauce and paprika." Beat egg yolks, celery, yogurt, Anaheim pepper, mayonnaise, mustard, Buffalo wing sauce, garlic salt, onion powder, black pepper, and paprika together in a bowl with a fork until mixture is creamy and smooth. Mix in Cheddar cheese. Place egg white halves on a platter. Spoon egg yolk mixture evenly into egg white halves. Most of this recipe I didn't measure out. When I make deviled eggs I just eyeball everything and taste while I mix. For those who have never made deviled eggs and want to try this, I did include a few measurements. 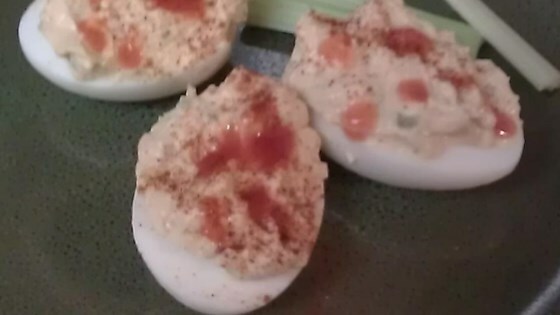 Super fun idea, lots of ingredients, missing the bright pop I look for a in a good deviled egg.